After the usual series of leaks and misdirection, we now have official confirmation of the existence of the Motorola Moto G. The new Android phone runs on a quad-core Qualcomm Snapdragon 400 chipset clocked at 1.2GHz, powering a 4.5-inch 720p display. Moto G has dual cameras (5MP and 1.3MP), plus there’s 8GB of onboard storage space (and a 16GB option) and Android 4.3 as the launch OS — and Motorola is “guaranteeing” an update to the 4.4 KitKat release by January of 2014. Motorola’s pitching the Moto G as a cheap smartphone that offers a high-end experience that beats the iPhone 5S in many areas for a lower price. People all around the world want to be a part of the mobile Internet so they can access the world’s information, share, and connect with the things that matter to them. But the smartphone industry has relegated hundreds of millions of smartphone buyers to second-class status, preventing them from experiencing the mobile Internet at its best. That’s because price-conscious consumers who don’t want to pay £400 or more for high-end smartphones have been left with two bad options. The first is to buy cheap, new smartphones made with second-rate technology that don’t do justice to modern apps and experiences like navigation, video chat and games. The second is to buy “low cost” versions of premium products that were released two or three years ago and are already obsolete. We think there should be a better option. Everybody deserves to be on the mobile Internet, and price shouldn’t stand in the way of anyone having a truly good smartphone to get them there. · A brilliant 4.5-inch HD display – the sharpest in its class – that goes edge-to-edge so you can enjoy movies, photos, video chats and more. · The newest Qualcomm® Snapdragon™ 400 quad-core processor for seamless multitasking and enjoying the web, videos and games, with all-day battery life. · Android 4.3 Jellybean, the most up to date Android of any phone in its class, with a guaranteed upgrade to Android 4.4 KitKat at the beginning of 2014. No skins to clutter or slow the experience, and great performance with Google’s unbeatable mobile services such as Gmail, YouTube, Google Maps, Chrome and Hangouts. · Stylish design with a comfortable curved back and 19 customisation options, including interchangeable Motorola Shells, Flip Shells and Grip Shells in seven colours. Moto G goes on sale this week in Brazil and parts of Europe and will be available within the next few weeks throughout Latin America, Europe, Canada and parts of Asia. It will be available in the US, India, the Middle East and more of Asia in early January. 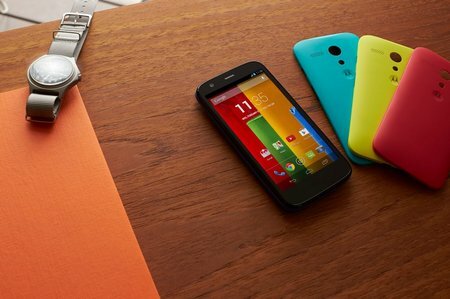 Moto G will be in more than 30 countries with 60 partners by 2014. Moto G will be available in the UK and Ireland from £134.95 SIM free with 8GB of storage and from £159 SIM free for 16GB. It will be available through various carriers and retailers including Orange and T-Mobile, O2, Phones 4u, TechData and Tesco Mobile. Availability in the UK starts from today. Check with local carriers and retailers for details on price and availability. £130 according to cnet for 8gb in uk. Just persuaded my girlfriend to plump up a bit of extra money a month and get a HTC One Mini and this comes out the very next day! Would have saved me a lot of hassle and her a significant amount of money! With the right marketing this could kill off a LOT of potential Windows Phone purchases, as their price point is around £100 to £150 for semi-decent entry level things. It’s mad. Was going to give the wife my old Nexus 4, but decided it’s just a bit too nice to be chucked in her handbag with her keys and change. This’ll do, though.